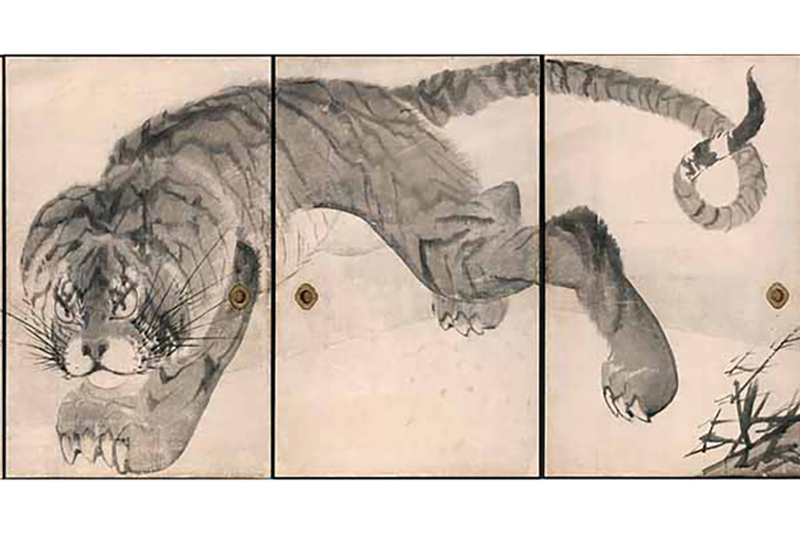 The time is 1786… On one moonless night, Japanese artist Nagasawa Rosetsu painted a huge tiger along with a dragon on the sliding panels of Muryōji Temple in Kushimonto. Descending from a “lineage of eccentrics”, Rosetsu (1754-1799) had samurai ancestors. A dazzling artistic genius who had a taste for sake, he quickly became a sensation in the art circles of the imperial capital of Kyoto, as one of the major disciples of the famous painter Maruyama Ōkyo. Steering this vibrant show are two curators, Khanh Trinh, curator of the Japanese and Korean art department at the Rietberg Museum, here accompanied by Matthew McKelway, professor of Japanese art history at Columbia University, New York, and also director of the Mary Griggs Burke Centre for Japanese Art. And here, you have to admit that results are on a par with Rosetsu’s talent: mind-blowing. Let’s remember that it took three years to prepare the exhibition. While Rosetsu has already been shown in Japan, in 2000, 2011 and 2017, this is the first time that a monographic show on such a scale is being dedicated to him in the West. In total, 55 pieces, paintings and drawings, some of which come from one of Kyoto’s major Zen Buddhism centers, as well as German and American museums. In short, a liberated, irreverential brush overflowing with humor, using techniques that were unprecedented at the time, such as finger painting. There are three good reasons for going to the Rietberg Museum this autumn. First, outside of Japan, this is a unique opportunity to enjoy Rosetsu in his original architectural context. 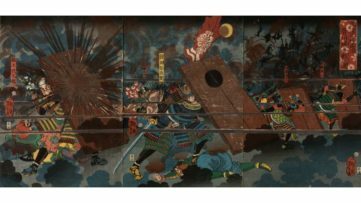 Second, 18th century Japanese painting is very much in vogue these days. So if you haven’t had the chance to be invited to the home of Joe Price, the great American collector based in Corona del Mar, California, who has gathered around 500 paintings from the Edo period (including four or five Rosetsus)… And if you missed the Parisian exhibition at the Petit Palais dedicated to another Kyoto “eccentric”, the famous Itō Jakuchū (on until 14 October)… Well you can make up for it by seeing Rosetsu. But hurry! For conservation-related reasons, the works can only be seen for eight weeks as loaners place a 60 day per year limit on exposing the paintings to light. Oh, and third, I almost forgot to mention… the Rietberg Museum is delightful! Rosetsu. Furious Brush, until 4 November, Rietberg Museum Zurich, Switzerland. Featured image: Nagasawa Rosetsu – Dragon, 1786.